I absolutely loved handheld LCD games growing up, and was constantly harassing my mom to buy whatever the latest one was that I would spot at the toy store so I could add it to my collection. In the pre-Game Boy era, there was just something so fascinating to me about having a little video game that I could tote around wherever I went. Of course, my brain would have exploded out of my skull had I known that a few decades later I’d have a device as powerful as an iPhone in my pocket, but I still hold a special fondness for those simple monochrome screens of yesteryear. 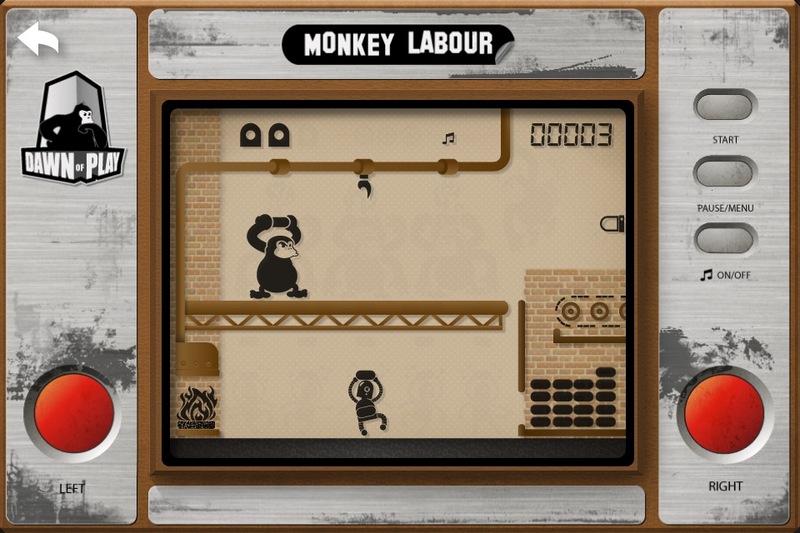 Apparently, the folks at Dawn of Play have a tender spot in their heart for the LCD era too, as evidenced by their game Monkey Labour [99¢]. Monkey Labour is a lovingly crafted riff on Nintendo’s Game & Watch handhelds, but with its own unique gameplay. It was released back in December, but a recent update added some interesting new graphical features and gameplay tweaks which caught my attention. 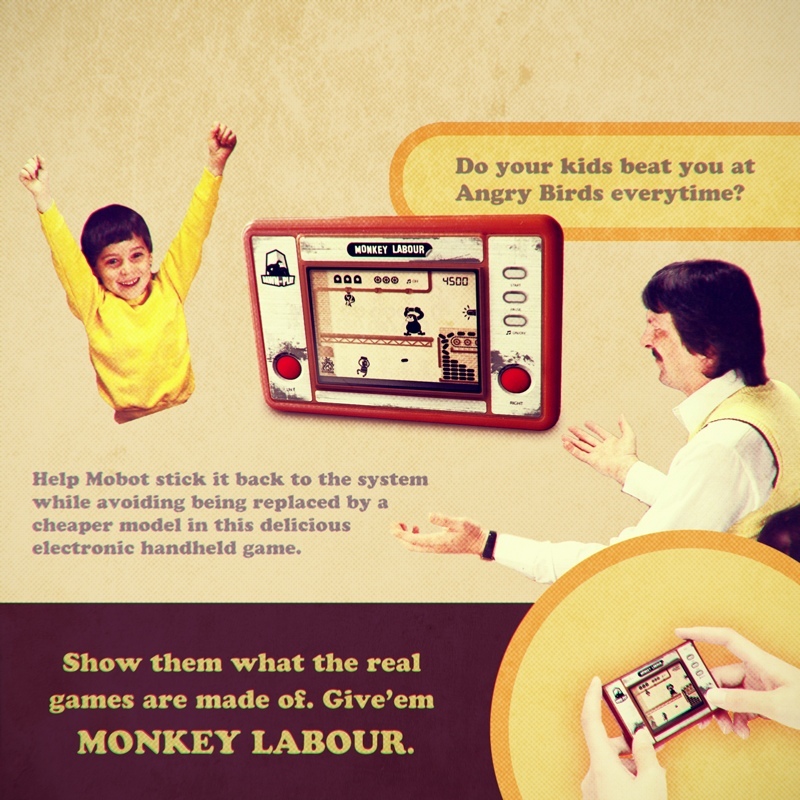 While LCD game recreations are nothing new on the App Store, none have come close to the level of detail contained in Monkey Labour. 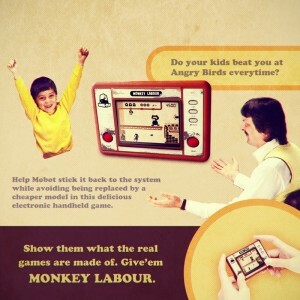 The game starts by showing a 3D rendered Monkey Labour handheld system, and the main menu is the back of the system itself – complete with imprinted product codes and removable battery lid. Starting a game flips the system over to show the LCD screen and buttons. Tilting your device and viewing the screen at an angle reveals all of the silhouettes of the game that are used to create the illusion of animation, just like a real LCD screen. When elements of the game are in motion, a subtle shadowing effect recreates the slow response time of an LCD screen. Best of all, touching the game screen will create dark pressure marks just as it would on a real liquid crystal display. These tiny details shoot the novelty factor of Monkey Labour through the roof for an experienced LCD game player, but luckily it also has solid gameplay to go with it. You play as a robot named Mobot who must travel back and forth along the bottom of the screen bringing logs to throw on a furnace. Your monkey boss moves along a platform above tossing bricks down at you which must be avoided. As you throw more bricks into the fire, the flames grow larger and will eventually ignite one of three leaks in a pipe above your monkey boss’s head. Time it just right, and you can torch the monkey increasing your score and adding to a multiplier. The game mechanics and two button control scheme in Monkey Labour work very well, and it will take fast reaction speed to earn any sort of meaningful high scores. One nice addition is Game Center integration for achievements and leaderboards for comparing high scores, which is something that wasn’t possible with original LCD games. It’s also a universal app, and although I prefer playing it on the larger screen of the iPad it feels more authentic to a classic handheld on the smaller screen of the iPhone or iPod touch. Just like the classic games that inspired it, the gameplay in Monkey Labour is incredibly simple on the outside but contains subtle complexity and depth which is hard to master. Fans of old LCD games should definitely check it out as the attention to detail is stunning and the game itself is quite fun. Younger gamers who grew up on more advanced systems might not see what all the fuss is about, but also might appreciate seeing what it was like for us old folks who gamed back in the day. Players in our forums have been enjoying the title, and just for the ability to relive my childhood experiences Monkey Labour is well worth the download.